Stockbridge, Mass. – As part of its 50th Anniversary celebration, the Norman Rockwell Museum presents Woodstock to the Moon: 1969 Illustrated from June 8 through October 27, 2019. Featuring works by more than 40 artists—some on view for the first time—as well as archival materials, the exhibition illuminates how Rockwell and other illustrators reflected popular culture during the final year of the tumultuous decade. Comprising works culled from the Museum’s collection and private and public collections around the country, Woodstock to the Moon: 1969 Illustrated is organized by Jesse Kowalski, Norman Rockwell’s Curator of Exhibitions. Norman Rockwell Museum is its only venue. From man’s first steps on the moon to a gathering of 400,000 concertgoers on a farm in Upstate New York, 1969—the year of the Museum’s founding—witnessed momentous cultural transition. Following one of the darkest years in post-War America, in which Martin Luther King, Jr. and Robert F. Kennedy were slain, the U.S. military faced setbacks in the war in Vietnam with the Tet Offensive and the My Lai Massacre, and college students led campus protests, the events of 1969 symbolized a time of hope and contrasts. Seminal works in the exhibition include Rockwell’s iconic depictions of the first moonwalk and of key events in the civil rights movement, presidential portraits, images of the war on poverty and the war in Vietnam, and his first rock album cover. Works by contemporaneous illustrators and designers will include the famous Woodstock concert poster by Arnold Skolnick, and examples of the inventive psychedelic art created that year for album covers, magazines, and posters. Woodstock to the Moon: 1969 Illustrated will be presented in two galleries of the Museum with sections devoted to the final edition of The Saturday Evening Post and Rockwell’s response, the news events of the year as illustrated by Rockwell and other artists, and the ways artists depicted the world of entertainment. The exhibition opens with a look at the final issue of The Saturday Evening Post, for whom Rockwell worked for forty-seven years, from 1916 to 1963. The magazine debuted on August 4, 1821, though its story begins much earlier. In 1729 Benjamin Franklin purchased the newspaper, The Pennsylvania Gazette, which continued to run until 1800. In 1821, issues of The Saturday Evening Post began printing from the same machines as Franklin’s Gazette. While Rockwell had left the Post in 1963, he did create an illustration depicting a weeping Ben Franklin referencing the final issue of the Post, which was published in Atlantic Monthly later that year. The second section examines the use of illustration to depict important news events during that pivotal year. Original artwork and archival material by Seymour Chwast, R. Crumb, Emory Douglas, John Berkey, and Wendell Minor will reference the Apollo 11 moon landing, President Nixon’s first year in office, underground comics, the war in Vietnam, and protests around the nation. The diverging styles of these illustrations speaks to the range of public emotions in a still turbulent time, striving for peace, order, and hope. Even though there were photographs of the first moon walk, illustrations of the landing were wildly popular, due to the unique ability of artists to evoke the excitement and hope that this extraordinary scientific and technological advancement inspired. Among the highlights of the exhibition is The Final Impossibility: Man’s Tracks on the Moon (Two Men on the Moon), a story illustration for the December 30, 1969 issue of Look magazine, on special loan from the collection of the National Air and Space Museum, Smithsonian Institution. Rockwell went to the NASA Manned Spacecraft Center in Houston to do research and take photos for his illustration of the now historic July 20, 1969 Apollo 11 moon landing. The painting of Commander Neil A. Armstrong standing on the moon’s surface and pilot Edwin E. (Buzz) Aldrin, Jr. descending from the lunar module “Eagle” was, he said, the most complicated and difficult of his series of space program pictures. The vibrant artwork created for music, films, television, books, and periodicals is the focus of the next sections of the exhibit. In 1969, Eric Carle and William Steig produced their award-winning children’s books, The Very Hungry Caterpillar and Sylvester and the Magic Pebble. Richard Scarry’s Best Storybook Ever was the New York Times bestselling children’s book in 1969. Original artwork by Carle and Steig will be on view along with examples of covers and ephemera. In Steig and Scarry’s work, we note the narrative use of animals with human qualities. Sci-Fi novels were growing their followers/continued their popularity and illustration remained the primary tool to achieve fictional world. Here the exhibit explores works by Frank Frazetta, Jeff Jones, and others who gained fame painting popular science fiction book covers. Frazetta was leading a new generation of illustrators, while still greatly influenced by Golden Age artists. According to Frazetta’s daughter, while rarely discussing his work, the artist did reveal that Norman Rockwell was his primary inspiration. The painterly, realistic style also used by James Bama and Jeff Jones, contrasts with the more graphic and modern works by Paul Bacon, Peter Bramley, and Diane and Leo Dillon. In Bacon’s cover illustration for The Andromeda Strain, we see almost a digitally styled image, several years before computer design became commonplace. One of the most exciting aspects of the field in 1969 was art created for the music industry. While photography was increasingly employed over illustration, both for time and cost effectiveness, musicians still looked to illustrators to represent their brand and the essence of their work on posters and album covers. Whether to evoke mood or capture the imagination, the music industry depended upon the creativity of illustrators to communicate with its audiences. 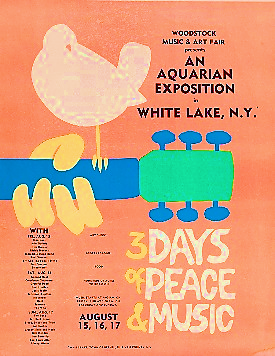 The headliner for the era was Woodstock, and Arnold Skolnick’s original poster for the festival begins this section of the exhibit. Skolnick used a clean, simple, yet bold graphic style, which he created in a few days for the concert organizers; he was paid $15 for his illustration. The former Brooklyn artist now resides in the Berkshires; his iconic guitar and dove poster remains his most notable work, and continues to be replicated in numerous ways. Other inventive and psychedelic illustration styles by artists such as Greg Irons and Randy Tuten are presented with vintage concert posters for Janis Joplin; Crosby, Stills, Nash, and Young; The Byrds; and Procol Harum. A spectrum of illustrated rock album covers for The Beatles’ Yellow Submarine, Led Zeppelin’s very first album, The Who’s Tommy, The Grateful Dead, Santana, and Jethro Tull show the many varied styles in the field of illustration. Artist Heinz Edelmann created the art for the Yellow Submarine film, album, and film poster. Included in the exhibit will be a rare watercolor poster he created for the film’s release in Italy. Norman Rockwell makes an unexpected appearance in this section with his only album cover, The Live Adventures of Mike Bloomfield and Al Kooper. The musicians were Rockwell fans and requested the artist create their 1969 cover. Archival photos of Rockwell with Bloomfield and Kooper will also be on view. Posters for new films in 1969, included a surprising number utilizing illustration. Hello, Dolly!, Paint Your Wagon, The Wrecking Crew, and other select works show stylistic graphic approaches that defined the era. Artist Richard Amsel uses a highly contemporary approach for the Hello Dolly! poster, greatly contrasting the film’s 1890s setting. On view for the first time ever will be Basil Gogos’ original painting of Boris Karloff as Frankenstein’s monster, painted for Famous Monsters of Filmland. Considered one of Gogos’ most famous works, he created it in memoriam of Boris Karloff, who died in February of 1969. The Gogos Frankenstein image has been replicated millions of times over. The exhibit will also include advertisements, magazine covers, and comic books, including The New Yorker, National Lampoon, Batman, Archie, and an Army manual illustrated by Will Eisner. Experimental works by noted illustrators of the era, including Lorriane Fox, Saul Steinberg, Al Parker, Bernie Fuchs, Jacqui Morgan, and Bascove, also on view, pushed the envelope in reaction to the traditional narrative illustration of earlier years. In Lou Glantzman’s cover for National Lampoon, as well as others, we see a nod to Norman Rockwell with humorous parodies. In addition to picture books, children experienced illustration through animation in the revolutionary new children’s television series Sesame Street, which debuted in 1969 merging animation, puppets, and live actors to promote early childhood education in a playful setting. Joan Ganz Cooney founded the Children’s Television Workshop, producer of Sesame Street, with the goal of using the power of television to educate children. Realistically portraying the changing times, Sesame Street looked different than other kids’ shows with an inner city setting and ethnically diverse performers. Just a year after its launch, the show had received its first of over 100 Emmy Awards, and Big Bird was featured on the cover of Time magazine. The powerful voice of the public was spurring change to Saturday morning cartoons. Protesting parent-run groups demanding less violence in children’s TV cartoons led to the cancellation of numerous programs. Soon-after, cartoon-giant Hanna-Barbera’s storywriters Joe Ruby and Ken Spears, and artist/character designer Iwao Takamoto developed the popular and long-lasting Saturday morning cartoon series featuring a dog named Scooby-Doo. The exhibition features a digital compilation of moving images from 1969 including youth programming and Saturday morning cartoons, television clips highlighting the moon landing, Woodstock, Vietnam, the World Series, celebrity interviews, concert footage, and film trailers. Woodstock to the Moon: 1969 Illustrated takes the viewer on a visual journey through a highly transitional time reflected in the art of popular culture. Celebrating Norman Rockwell Museum’s 50th Anniversary, Woodstock to the Moon: 1969 Illustrated is one in a suite of special exhibitions on view this year, being sponsored by Audrey and Ralph Friedner and TD Bank. The Museum will feature related programs throughout the run of the exhibition with further details to be announced. For more information about the exhibition and related programs, visit www.nrm.org. Great Barrington, Mass. — Great Barrington Rudolf Steiner School welcomes families to a unique visiting day for children and grownups on Wednesday, May 1, at 11am on the front lawn at the Steiner School, 35 West Plain Road, Great Barrington, MA. It’s a Free event. 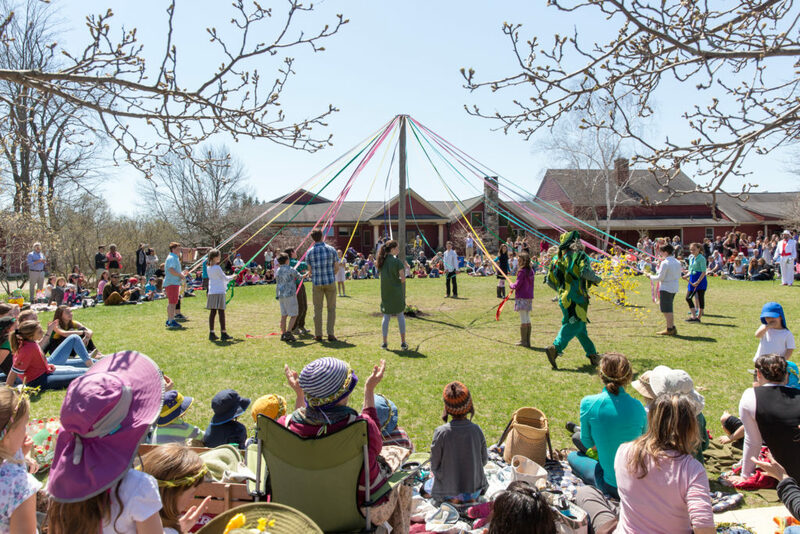 Join the entire school community at 11am for the May Day Festival featuring our local Garland dancers, the Morris men and women and the 4th through 8th graders perform traditional dances around the May Pole. Led by Master of Ceremonies Evers Whyte. The May Day celebration continues with dancing for the whole community and picnics on the lawn. The community is invited to bring family and friends, blankets, hats, sunscreen and picnic baskets, and welcome the season joyfully! This is a regular full day of school with activities for the students after the picnic lunch starting at 1 pm. To learn to be productive, disciplined and constructive members of society, as well as good stewards of the earth, students learn traditional folk dances, craft May Crowns and Celebrate the return of Spring, the beginning of planting season, after a long Northeastern Winter. “What better way to welcome Spring than by reconnecting with nature in a fun, festive and educational way?” comments Farming & Gardening teacher Hadley Milliken. Pittsfield, Mass. – Berkshire Community College (BCC) is proud to be hosting “Civil Rights Movement – Then and Now” on Wednesday, April 24, 2:00-6:00pm in collaboration with the NAACP-Berkshire County Branch. The event will take place on the Main Campus, located at 1350 West Street in Pittsfield, MA. The event is free and open to the public. The event features a keynote address from Whitney Battle-Baptiste, Associate Professor and Director of the W.E.B. DuBois Center at UMass Amherst, a slideshow presentation with former BCC faculty Don Lathrop called “Civil Rights Movement in the 1960s,” a BCC student presentation, a Human Library with community members, haikus with the BCC Writing Center, and more. At 5:00 p.m., the BCC Amphitheatre naming ceremony will take place with President Ellen Kennedy and Sarah Lee Guthrie, followed by songs of the Civil Rights Movement, with Wanda Houston and Paul Green. Snacks will be provided for this event. People who are interested in attending are encouraged to register at www.berkshirecc.edu. Housatonic, Mass. — April 19 — Berkshire Pulse, the dynamic dance and performing arts education center located in downtown Housatonic, is excited to announce its upcoming summer calendar of arts programs for youth, including a new Musical Theater Intensive. All programs will be held at Pulse’s extraordinary spacious, state of the art studios, and are particularly noteworthy not only for the wide range of inspiring and challenging subject areas, but also for the high caliber of participating artist-instructors. The Musical Theatre Intensive will take place July 15-19, offering young people age 13+ a week of high-quality training in acting, voice, audition techniques, jazz and tap. An extraordinary team of professional artists will share their guidance, talent and expertise with students, including Broadway dancer Nick Miscusi, head of the acting program at MCLA Laura Standley, and Broadway star Donna Bullock (City of Angels, Ragtime, A Class Act). Students will be immersed in the business of musical theatre and leave with a monologue, audition song, and a host of standard musical theatre steps that will ensure confidence when in the audition process or onstage. Tony-nominated actress Lauren Ambrose will also lead a daylong master class. Last year, Ambrose portrayed the lead role of Eliza Doolittle in the Lincoln Center revival of My Fair Lady on Broadway, a performance for which she was nominated for the 2018 Tony Award for Best Actress in a Musical and won the 2018 Outer Critics Circle Award for Outstanding Actress in a Musical. “I am so excited to work with these young performers,” Ambrose said recently. Among the other outstanding summer program offerings are Improv Acting (June 24-28), where young people age 14+ will work with the Hat Factory, the resident acting company of Pulse, for a week of short and long form improvisational, spontaneous theatre-making, improv games and SNL-style skits. Students will learn to tap into their imaginations, trust and follow their impulses, and expand their character-building skills while learning how to make bold, fun, and daring theatre. The program culminates in a performance on Saturday June 29th at 7:00 pm. Rhythm Alive! (June 24-28, 9:00 am – 3:00 pm) teaches students age 8+ to hear, see, feel, create and appreciate the rhythms they find in and around Pulse’s studios. Recordings of these rhythms will be used to make dances, music, and art utilizing techniques in tap, drumming, hip-hop and African dance. There will be time for sharing what was learned with family and friends on the last day. Dance Discovery (July 1-5, 9:00 am – 3:00 pm) is a program for movers age 9-13 who want to try multiple forms of dance in a fun, friendly environment. Participants will study modern, ballet, dance making, and get a taste of African and contemporary dance. This is an excellent opportunity for new students to be introduced to dance and for experienced beginners to expand and further develop skills. This is immediately followed by Dance Beyond Borders (July 8-12) where students age 10+ will spend a week traveling through different cultures, worlds and styles of dance. The program emphasizes modern dance technique and includes dances from Brazil, Africa, Spain and New England. Daily lessons in dance making allow students to create their own choreography, drawing not only from the dance forms covered but also their own creative movement vocabulary. A new program, A Week for Boys! (July 15-19), is designed for physically active boys age 9+ who want to learn to move using acrobatics, Parkour, martial arts and movement creation to develop confidence, coordination, strength and flexibility. 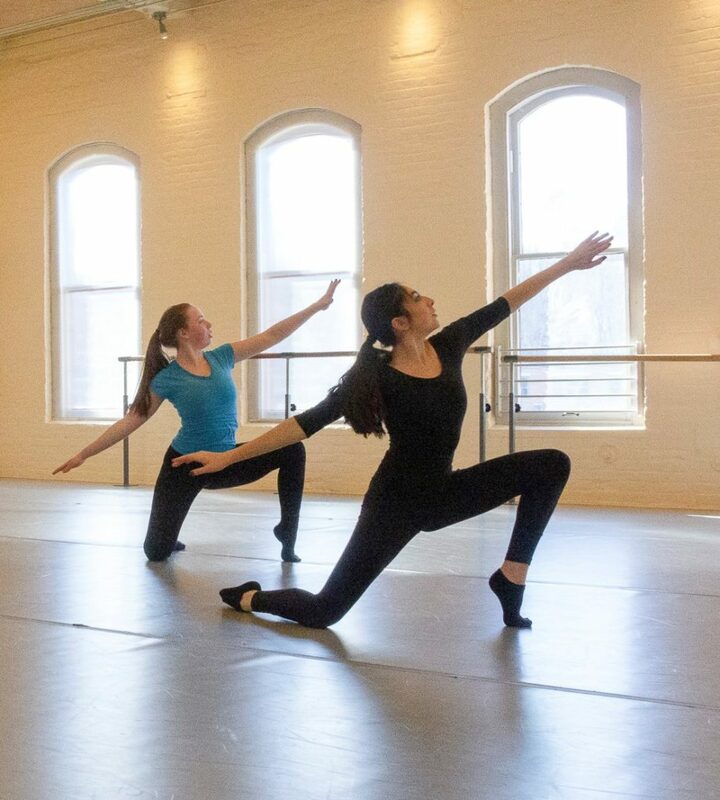 Finally, the three-week Dance Intensive (July 22-August 10) is an inspiring, robust and challenging dance experience for intermediate/advanced level dancers ages 13 and up. The first two weeks focus on techniques and wellness, with classes in modern, contemporary, ballet, modern, jazz, the Alexander Technique, dance making, African, hip-hop and Flamenco. Week three adds creating dances, including devising a site-specific work. A tour of Jacob’s Pillow will take place Friday, August 2, where students will explore the archives, observe classes and watch an Inside/Out performance. This Intensive ends with a public performance on Saturday, August 10. In addition to these special programs for youth, Pulse offers a wide range of community classes for people of all ages. In an effort to provide a place where all people, regardless of their economic status can come to experience the joy, self-confidence and discipline that performing arts training instills, Pulse provides tuition assistance to enable anyone who is interested to participate. 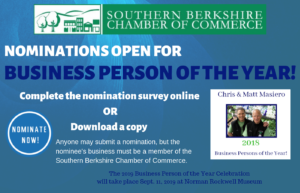 For more information, visit www.berkshirepulse.org or call (413) 274-6624. North Adams, Mass. – Massachusetts College of Liberal Arts (MCLA) Gallery 51 is proud to introduce this year’s senior art show, An Inquiry into _____, a culmination of senior art and arts management majors’ art works. The opening reception will take place on from 5 to 7 p.m. on April 25, 2019 at MCLA Gallery 51, 51 Main Street, and the exhibition will remain open through May 19. This event is free and open to the public. Refreshments will be provided. The show will feature work from Bailey Brissett ’19, Amanda Romanelli ’19, Louis Torres ’19, and Cheyenne VanBramer ’19. The title of the exhibit reflects their individual inquiry or act of asking for information about mental illness, the subconscious realms, storytelling, and self-decomposition. Each artist has learned much of what they know through the internet. The image on the poster reflects that their generation is unique in that way; they seek information from the collective consciousness of the internet rather than from peers, parents, or teachers. Brissett uses herself and mental illness as artistic muses to convey honesty and understanding, which can be seen in her work displayed in this show. “My artwork is where humor and honesty meet and live in a strange and colorful realm that celebrates individuality and art with a purpose,” she said. Romanelli chose to use bananas as a metaphor for the deep meaning behind her work, which is not actually about bananas. “My art encompasses the ironic simplicity of what it means to be a human being by commenting on norms and behaviors that over time we have grown to accept,” she said. MCLA Gallery 51, run by the Massachusetts College of Liberal Arts since 2005, exhibits work from a wide range of emerging to mid-career contemporary artists to the greater Berkshire community. The gallery hosts ten exhibitions each year and countless events and happenings. Staffed by mostly student workers, MCLA Gallery 51 provides students with hands-on experience in the day-to-day operations of a gallery. MCLA Gallery 51 is a project of MCLA’s Berkshire Cultural Resource Center. MCLA’s Berkshire Cultural Resource Center (BCRC) provides opportunities, resources, and support to the Northern Berkshire Community. BCRC brings together the Northern Berkshire, MCLA and greater creative communities through its cultural programming, including MCLA Gallery 51, DownStreet Art, Berkshire Hills Internship Program (B-HIP), and MCLA Presents! The BCRC promotes, facilitates, and encourages a dialogue to foster a sustainable, creative community. Stockbridge, Mass. – April 18 – Sarah Eustis, CEO of Main Street Hospitality Group, announced the company’s commitment to enhancing and intensifying its ongoing sustainable practices. Programs include a partnership with Clean the World, large size refillable room amenities at all hotels, elimination of plastic straws and drink stirrers, elimination of single use plastic bottles, and much more. “The move is the most recent commitment to responsible ‘earthkeeping’ practices employed by the hotel management company,” said Eustis. “Throughout the company and to a person, we are steadfast in our responsibility to smart, sustainable practices. From simple actions, like being mindful to turn off lights, to larger initiatives like replacing inefficient HVAC systems, we consistently seek alternative, ecologically sound practices that lighten our hotels’ footprint while benefiting the communities we serve,” she added. In addition to increased energy-efficiencies in heating and lighting, a water-saving on-request linen laundry service, and rigorous recycling of plastic and metals, the company’s best practices include a major food composting program in partnership with local farmers. The Red Lion Inn alone collects nearly 36 tons a year of compostable food and end products that are delivered to local composting farms for the benefit of a number of farmers in the region. Also by the summer, all MSH properties will have phased out individual bath amenities products for large bottle amenity dispensers. Since 2018, MSH has partnered with Clean the World, a global hospitality recycling and waste reduction program, to collect used soaps and small bottled amenity products. These are shipped to be sanitized, reprocessed and reformed to create new soaps and hygiene kits to assist with disaster areas, homeless shelters, and impoverished communities worldwide. “This somewhat small gesture of amenity repurposing aids in reducing bacteria and virus outbreaks due to the lack of sanitation, which is the number one cause of infant mortality,” noted Eustis. The company will continue to work with Clean the World to repurpose small face soaps once the bulk amenity dispensers are in place. Since the partnership began, MSH properties have contributed a combined 1,560 pounds of waste soap or more than 25,000 partial bars of soap that were converted into nearly 3,500 large bars of soap for distribution. At the same time, 686 pounds or nearly 11,000 bottles of amenity plastic were collected and reprocessed into 1,830 hygiene kits that have been distributed by Clean the World to those in need. Formed in 2013, Main Street Hospitality Group is a hotel management company founded originally at The Red Lion Inn in Stockbridge, Massachusetts, with a long tradition of excellence in preservation, innovation, sustainability and operations. As owners and operators of some of the most distinctive hotels in the Berkshires, the company’s mission is to deliver unparalleled experiences for guests, employees and owners through an authentic approach to hospitality, service, and management. 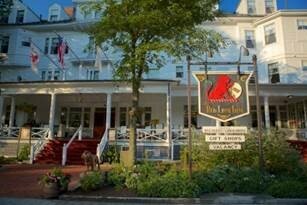 Main Street’s management hotel portfolio includes The Red Lion Inn, Maple Glen at the Red Lion Inn, The Porches Inn at MASS MoCA, North Adams, MA, Hotel on North, Pittsfield, MA, The Briarcliff Motel, Great Barrington, MA, and Race Brook Lodge, Sheffield, an affiliated hotel. The company has expanded its management portfolio with the recent addition of the Hammetts Wharf hotel in Newport, RI, slated to open in 2020. For more information, please visit www.mainstreethospitalitygroup.com or call 413-298-1610. Lee, Mass. 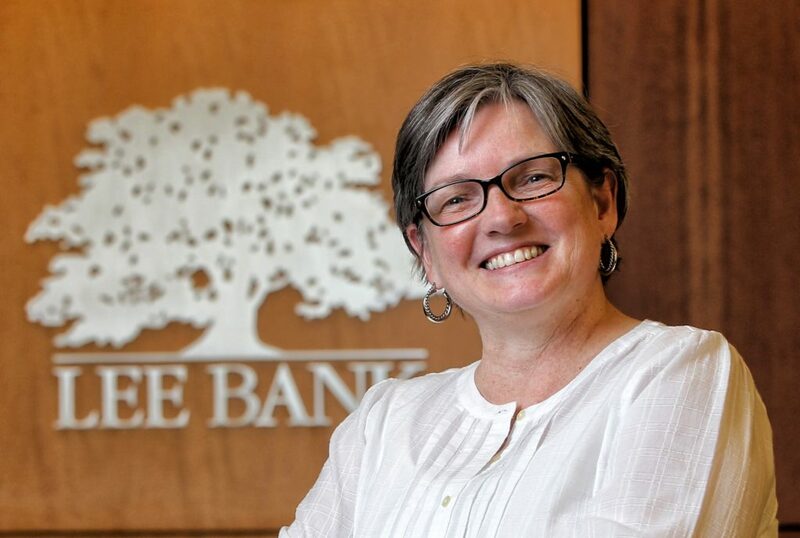 – April 18 – Lee Bank recently announced the promotion of a key leader within the company to support its continued growth in 2019. Paula Lewis has been named to the position of senior vice president of retail lending. Lewis joined Lee Bank in 2012 as vice president of mortgage loan operations, and was promoted to first vice president of retail lending in May of 2017. In her new position, she joins the senior officer team, and continues to oversee residential lending. She is also a member of Lee Bank’s ALCO committee and its executive loan committee. Lewis has been lending in Berkshire County for 28 years and is committed to offering products and lending standards that brings the community back into banking. Williamstown, Mass. —The Clark Art Institute’s Research and Academic Program welcomes Clark Fellow Celeste Olalquiaga for a free public lecture, “In Quest of the Gorgon’s Head,” on Tuesday, April 30 at 5:30 pm. The lecture will be held in the auditorium, located in the Manton Research Center. The terrifying Medusa of mythical fame is a reinterpretation of an archaic apotropaion, or protective emblem, the Gorgoneion. Greek classic culture transformed this protective figure into a destructive one, creating a paradoxical icon of female fury and power. Celeste Olalquiaga is a cultural historian dedicated to the contradictions and leftovers of modernity. Her books, Megalopolis (1992) and The Artificial Kingdom (1998), have been translated to several languages, and she is the recipient of Guggenheim and Rockefeller awards. In 2013 she founded Proyecto Helicoide, dedicated to rescuing the cultural memory of a futuristic ruin in Caracas, producing exhibitions there and in New York, and co-edited Downward Spiral: El Helicoide’s Descent from Mall to Prison (2018). At the Clark, she is working on a rereading of the myth of Medusa that focuses on its origins in the Gorgon and the evil eye. Stamford, Conn. – April 15 – William Pitt-Julia B. Fee Sotheby’s International Realty, the premier luxury real estate firm serving Connecticut’s Fairfield County, Litchfield County, Farmington Valley and Shoreline markets, Berkshire County, Mass., and Westchester County, N.Y., announced that it recently held its annual company networking event for over 1,000 agents company-wide. The theme was “Evolution,” paying tribute to the company’s position as a proven leader in innovation since 1949 even as new initiatives were unveiled. Breunich was the first to take the stage, setting an optimistic tone when reflecting upon the company’s recent successes and laying the foundation for an exciting and promising future. Vincent Socci, Chief Operating Officer, introduced the company’s radically new tech platform in a live demo before introducing Eric Stegemann, CEO & Director of Strategy, TRIBUS. The company and TRIBUS together have worked to develop a fully integrative digital solution that seamlessly brings the company’s best in class tools and products together into a single space. Isadora Badi, Vice President, Global Marketing, Sotheby’s International Realty highlighted the brand’s strategic marketing initiatives, while Carolyn Fugere, Vice President of Strategic Growth, hosted a panel of new and seasoned agents in a discussion centering on a revolutionary sales method demonstrated to increase agent production levels by as much as 30%. James Wong, CEO and Founder, MAXA Designs, followed with a demonstration of his company’s product that the agents have taken in as their one-stop-shop for custom marketing materials. Keynote speaker Mel Robbins, a CNN contributor and creator of The 5 Second Rule, closed the presentation with her simple strategy for achieving unimaginable success. The day concluded with a cocktail reception, offering hors d’oeuvres, an open bar, frozen boat drinks, and a DJ. Sponsors included platinum-level sponsor JPMorgan Chase & Co., gold sponsor The Wall Street Journal, silver sponsor PlanOmatic, bronze sponsor Sotheby’s International Realty, cocktail party reception sponsor TRIBUS, red carpet sponsor Buyside, speaker sponsor The New York Times, interactive photo booth sponsor My Marketing Matters, dessert sponsor William Pitt-Julia B. Fee Insurance, as well as Vizzi Edberg, modernangles, W.B. Mason, Waterfront Branded Marketing Solutions and Exposure Media Group. 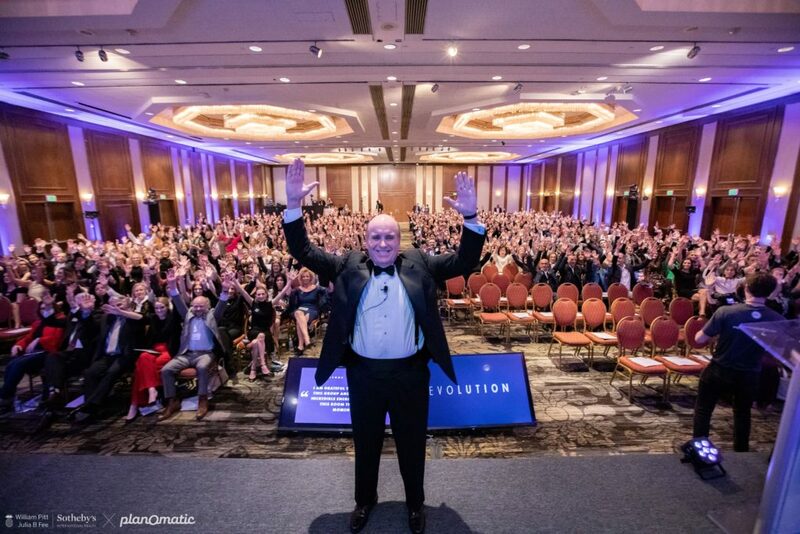 “Evolution” was held on April 10, 2019 at the Hilton Stamford, located at One First Stamford Place in Stamford, Conn.
Great Barrington, Mass. – Organization Ink advocates for on-going professional development as we work with our Clients and within the Community. We walk the talk as two of our team members have recently completed Certification programs. Gaye Weinberger, our Operations Manager, just completed the Sr Certification from The Society of Human Resource Management (SHRM-SCP) and will take on the role of Director of HR Services. In this role she will provide support to our existing HR Services clients and continue to develop the depth of those services. Alyssa Hogdgon joined Organization Ink in the fall, after completing a Masters Degree in Accounting from Bay Path University. Since joining us she undertook the Quickbooks certification program and become a Quickbooks Certified ProAdvisor. Alyssa works closely with new accounts to ensure they are set up with a sound accounting foundation and build on that for growth. We continue to grow the depth and scope of expertise to better serve our Community and Clients. Organization Ink is certified DBE& WBE business serving the small business community. Operating since 2014, we provide a robust complement of services in the Accounting, HR and Operational areas. Visit us at www.organizationink.com.